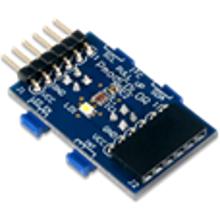 Product information "Pmod Color Sensor Module"
The Digilent Pmod COLOR is a color sensor module with the ability to sense red, green, blue and clear light. The onboard AMS's TCS3472 integrates an IR blocking filter to accurately determine the color of objects as well as sense ambient light under varying lighting conditions and through attenuating materials. Related links to "Pmod Color Sensor Module"